At the start of 1963 Britain was in the grip of the coldest winter for nearly 300 years. Conditions in France didn’t fare much better and, after a harsh winter, summer was cold and damp, leaving a crop blighted by dilution and rot. Highlighting the true spectrum of vintage variation, weather conditions in 1964 were excellent. A mild and dry winter punctuated by periods of severe frost continued until the end of April. An unusually hot May prompted the vines to flower around the 12th of June, and the rest of summer continued to be warm and sunny, with little rain. Harvest began on September 16th, and the resulting wines proved to be one of the great classic vintages in champagne. It would also mark the end of an era for the brand, as it was the last vintage to use small wooden casks and concrete vats for the first fermentation. Winemaking techniques were progressing significantly in the early 1960’s with pioneers such as Emile Peynaud pushing the virtues of using stainless steel containers, which had proved successful in the dairy industry. Along with the standard benefits of steel being inert (thus avoiding oxygen spoilage) and giving the winemaker the ability to accurately control the inside temperature of the vat (controlling spoilage through extremes), the changeover also had one significant side effect. Replacing existing equipment with newer larger vats meant that they could begin to raise production levels in line with the growing demand. Fittingly, for the final vintage seeing wood, the 1964 is described as a dark and dense wine, albeit still fresh and not over-bearing. The nose contained hints of raisin, alongside toast, vanilla and hazelnut. The palate contained arabica, and musky accents of new leather and sandalwood, giving way to vanilla, spices, nutmeg and dried fruit. Tasted in 2004, the wine continued to show the nutty tones from age and the freshness of its youth, but the palate was now joined by persistent butterscotch running throughout the exceptionally long finish. The vintage was released on to the market in 1971 and, as was now becoming the norm, a Rosé vintage was also produced. The weather pendulum swung back the other way in 1965, and winter and spring were mild and cloudy. Temperatures stayed moderate throughout summer, leading to a late and unremarkable vintage, picked from the second week of October. 1966 was a landmark year in many ways. The swinging sixties were in full swing, and England finally managed to win the World Cup. The French also had something to celebrate as the year produced another excellent vintage. A warm and consistently dry summer ensured that there were no issues with disease or rot, and picking of the fully ripened fruit began on September 22nd. The good weather conditions continued throughout the harvest. The wine produced was mineral and smoky on the nose, and vanilla blended with honey, gingerbread and dried apricot on the palate. The Rosé from this legendary vintage had meringue, tea, roses and fleshy Pinot Noir flavour. Away from the wine now being produced in stainless steel for the first time, the 1966 Dom Pérignon also saw other changes. First was the introduction of a bespoke capsule (the small metal cap that protects the top of the cork and adds structure within the metal cage). Up until this time a standard Moét capsule had been used (see picture below), but from now on, the capsule used would be specific to Dom Pérignon. The original design was black in colour with the brand name written in red, within a red circle. This design would comprise part of the packaging until the 1988 vintage. A further change came in the presentation of the bottle, and the custom box that it came in (see picture below). Vintages from the 1950’s had been presented in thick double-walled cardboard bottle covers for protection, but that packaging now evolved in to an oblong box with varying designs for the next few vintages. 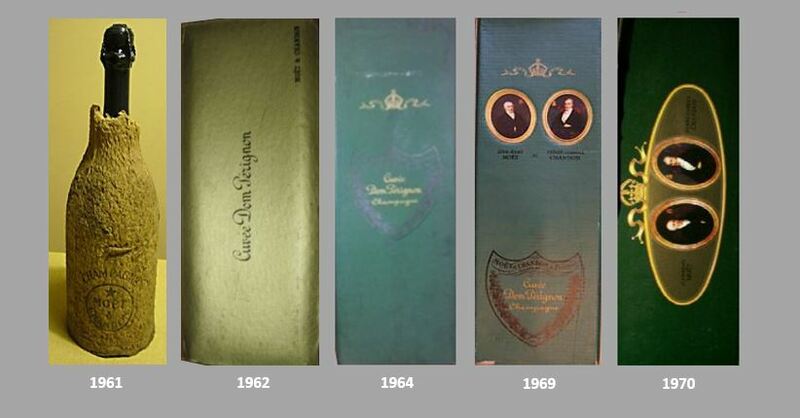 The plain gold coloured box was used in stores such as Harrods for the rarer magnums, whilst the green boxes used for the standard vintage were adorned with pictures of Jean-Remy Moét and Pierre Gabriel Chandon. The final declared vintage of the 1960’s was the difficult 1969. Weather conditions throughout the year had been wet and unstable, leading to significant mildew, and late flowering. September finally provided the dry sunny spell that the grapes needed, and the slightly delayed harvest began on the 1st of October, but gave a lower yield than usual. With a subtle nose, the palate of the wine was full of stone fruit and preserved citrus fruits, twinned with notes of caramel, undergrowth and faded flowers. The wine was quite restrained on release and took some time to show its full depth of palate. The vintage, classed by many as great but not excellent, was released to market in 1976. One final thing of note is that the 1969 was the first vintage to use pewter foil to dress the top of the bottle, covering the cork and capsule. To protect the seals from invading dirt and dust, traditionally, bottles were dipped in to a wax sealant which quickly dried and formed a protective layer. True to its 18th century style origins, Dom Pérignon had heretofore been sealed this way, but made the subtle change as new covering options became available. Bottles of the 1969 have been seen with both styles of seal, and so the changeover happened at some point during the production of the vintage. The Rosé, which was released two years after the vintage wine, therefore tended to have the pewter seal. The 1950’s saw a post war boom in production and consumerism when rationing ceased and materials became available again. The optimism for the future, and introduction of inventions that would revolutionise the household (Television, Refrigerators etc) changed how people shopped, and what they shopped for. 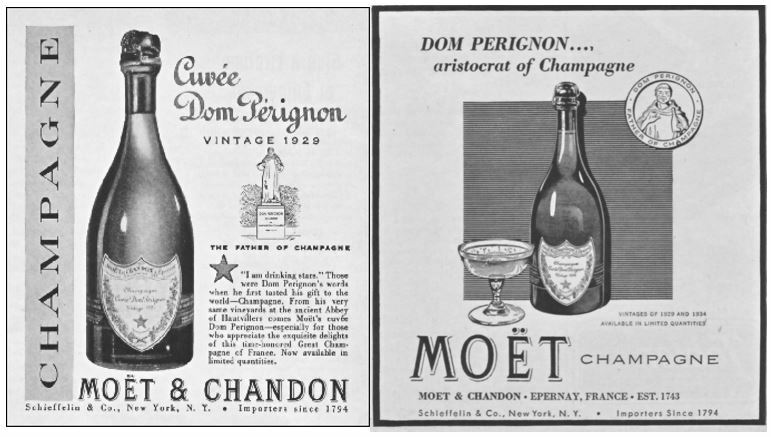 With paper shortages a thing of the past, lifestyle magazines became an ever present staple in the house, and Dom Pérignon were in from the start, advertising their 1929 and 1934 vintages in print in 1950/51. Sales began to rise accordingly (see previous chapter for figures). The next vintage up for release was the perfect harvest of 1947. Picking of the grapes had started on the 5th of September that year, making it the earliest harvest since 1893. The 1955 release of the 1947 vintage was a first for the brand as it represented the first original blend made to a Dom Pérignon ‘style’ (previously released vintages had essentially been extra matured Moét champagne transferred to the DP style bottles). They would also fall in to the vintage/release cycle that is still going to this day for the standard vintage releases. Wines in their first plenitude of readiness will be offered to market after maturing in the cool chalk cellars for between 6 and 9 years. With the brand now being fermented in their own bottles for the first time, and with glass shortages a thing of the past, the 1947 vintage was the first to be made available in magnums (1.5 litres, equivalent to 2 standard bottles). Bottle sizes were further diversified in 1949 with the double magnum being re-christened the Jeroboam, and the addition of larger sizes such as the Methuselah. The naming conventions all derived from biblical references with grand connotations, but it would be many years before the King of Champagnes Dom Pérignon would be released in either of these larger sizes. Importantly, the 1947 vintage also marked the first time that the brand was made commercially available outside of the US market. 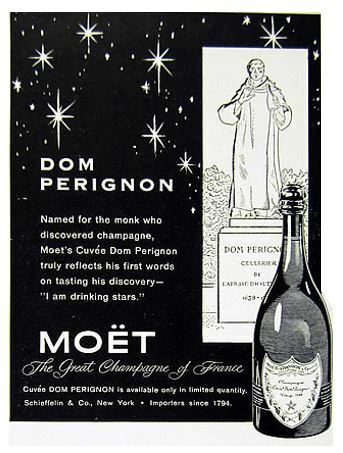 The next vintage declared good enough for a Dom Pérignon release was the 1949. Harvest that year commenced on the 19th of September, and concluded quickly as rot threatened to destroy the grapes. Thankfully, due to the speed of picking, losses were minimal, and the vintage was released in 1957. The next two harvests saw poor weather in the Champagne region, and 1952 didn’t immediately look like it was going to be any better, with harvesting commencing on the 8th of September in unfavourable conditions which continued throughout picking. The resulting dark amber wines were on the austere side and quite restrained/closed on their release in 1958 after just 6 years of cellaring. Rather than the characteristic toast, cream, bread and honey delivered by an atypical Dom Pérignon, the resulting wines erred towards deeper notes of meat, truffles and leather, and it seems a wonder that 1952 was declared a vintage at all. Roger Moore’s characterisation of James Bond seemed to enjoy it though, in the film ‘The Spy Who Loved Me’. The 1953 vintage was up next with a harvest that began on the 15th of September. Following an uneven flowering, the good weather seen in August continued throughout September, producing a healthy crop. Champagne was an integral part of the glamour associated with the last ‘Golden age of Hollywood’ and actress Marilyn Monroe would cite the 1953 as her favourite vintage of Dom Pérignon. Indeed it was rumoured that at her last official photo shoot for Vogue magazine 6 weeks before her death (taken by photographer Bert Stern and posthumously released entitled The Last Sitting’) Marilyn drank three bottles of the 1953 to help her get through the sessions. The brand was also getting a helpful boost by the big screen adaptations of the aforementioned James Bond paperbacks, and virtually all of the earlier movies had Bond drinking Dom Pérignon somewhere along the line. The first Bond film ‘Dr No’ (released 1962) is right up to date with the villainous Dr No opting to serve the current 1955 vintage, only for Bond to say he prefers the 1953. The harvest of 1955 began at the beginning of October, and produced a bumper crop ahead of all expectations. It has been widely hailed by many critics as the greatest vintage of the 50’s, and is described by current Dom Pérignon winemaker Richard Geoffroy as “the archetype of the classical vintage”. Is this one instance where Mr Bond was wrong? Interestingly Bond is still drinking his preferred 1953 in the film ‘Goldfinger’ (released 1964), but has moved on to the 1955 vintage in ‘Thunderball’ (released 1965). Bond was certainly on poor form in the 1969 film ‘On Her Majesty’s Secret Service’, ordering a vintage which didn’t exist. He erroneously asks for the 1957 which was a disastrous harvest ruined by frosts that reduced crops by as much as 75%. Given that the film was made in 1968 at a point when later vintages had already been released, this looks like a serious error in research by the production team (Moét have confirmed they only found about the reference once the film was released). Perhaps it is fitting that George Lazenby, whose sole appearance as 007 is largely viewed as a mis-step by the franchise, drinks the 1957 Dom Pérignon which also didn’t quite make the grade? Many valuable lessons had been learned from the First World War, and it’s testament to many canny vintners that such large stocks of wine from the period between then and the end of the second war existed. This forward thinking included storing better vintages or large volumes of wine in spacious out of the way areas in their cellars, and then blocking them off behind false bricked walls. This allowed vast stores of bottles to escape the thirst of the invading German soldiers. The post war years saw a battered Champagne in a time of reflection and re-building that would take nearly twenty years to complete but, unlike the first war where they could only slake the local thirst, this time they had both large stocks, and a world market. Both the now mature 1928 and 1929 vintages were waiting in the wings as was the 1934, and these were released one after the other in 1948, 1950 and 1951 respectively, really making a statement in the marketplace. The harvests for 1928 and 1929 had both commenced at the end of September but, whilst the 1928 only yielded an average crop (albeit of exceptional quality), the 1929 harvest had followed a glorious summer and it produced the largest crop since 1904. 1934 also saw a generously sized harvest, with rapid flowering from the good weather conditions, and no notable impact from disease or insects. As you can see from the adverts below (dating from 1950 and 1951), the 1928 vintage sold out quickly, and that by the time the 1934 came on to the market in 1951, there were still stocks of the 1929 to push in conjunction. As mentioned above, the 1928 crop was only an average yield, but both the 1929 and 1934 were larger than normal in size. It’s important to remember that in these post-war years when sales were really starting to take off, the double bonus of a good vintage also being a large yielding year was extremely important to keep a producer in operation. Bearing that in mind, whilst it is strictly true, it’s interesting to note that both of these adverts use the words ‘limited quantities’, really pushing the wine as a rare thing. This follows through with the way the brand uses the heritage of Champagne, citing Dom Pérignon as the ‘father’ of it all, delivering the (now) well told tale of ‘drinking stars’, and even going as far as to label the wine as the ‘aristocrat of Champagne’! Very rich words for a Champagne only releasing its fourth vintage. Looking back at how the Champagne had performed over this period can easily be seen from their sales figures. When the 1921 was released in 1936 they initially had just the 100 cases sent to the USA. By the outbreak of war in 1939 when shipments ceased, this demand had increased three-fold. As sales resumed with the three new vintages, demand increased ten-fold on the original shipment, and by 1954 yearly sales sat at 1000 cases. By the beginning of the 1960’s this figure itself would further increase again (4500 cases in 1960, and 6000 cases in 1961). Wine experts are in clear agreement that 1934 and 1937 were by far and away the best vintages for Champagne in the 1930’s, so why was no Dom Pérignon 1937 produced? Or was it produced? Whilst no paperwork exists in the Moét archives relating to the vintage, renowned Champagne expert Richard Juhlin claims to have tried it (in fact, he claims to be the only palate in the world to have tried every vintage of Dom Pérignon, including the rare 1926). Describing it as “very good”, he goes on to acknowledge that he is aware that it is a rogue vintage, yet finds it difficult to believe that the wine he tried, complete “with its original cork” isn’t genuine. To try and qualify the tasting note, it’s interesting to offer that perhaps any paperwork relating to the harvest and blending slipped through the cracks during this time, either in the lead-up to war or during any periods of occupation. Given that the resulting wines would have been released sometime in the 1950’s when clear documentation exists this does seem unlikely (unless the invading forces drank virtually every bottle and it was never offered for sale). It’s also highly suspicious that no other bottles or label images for the 1937 have turned up, so a head scratcher it must remain. Overall, less champagne was made during the Second World War, but both 1943 and 1945 were excellent years. Whilst the 1943 would go on to be released as a Dom Pérignon vintage, no 1945 Dom Pérignon was produced. As Moét released a Vintage Champagne for the year, it’s likely that this was simply down to the fact that the 1945 harvest produced only a small crop, and there wasn’t enough to go around. A small point to note – there was no 1944 vintage as ordered in the UK sitcom Red Dwarf series 2 episode ‘Better than life’. Curiously, James Bond author Ian Fleming would also make a similar mistake, inventing the 1946 vintage in the paperback version of ‘Moonraker’, the third Bond book in the series, published in 1955. With this example I can only assume that at the time of writing (January/February 1954) Fleming was trying to keep Bond current by predicting the next vintage, which were running something like 10 years behind now that all the longer matured vintages were out on the market/sold. The ’43 came out in ’53, the ’45 in ’55, so it’s not unreasonable that he thought that the ’46 would be up next. As it transpired it was the 1947. The 1943 appeared in 1953 (commanding $10.50 per bottle according to a US sales advert from the time), and was extra special for several reasons. Firstly, it contained a special label (the first of many!) commemorating the 200 year bicentenary since the Moét house was founded, proudly stating ‘Cuvée du Bicentenaire’ at the top of the shield. Secondly, the release was timed/coincided nicely with the UK Royal Coronation celebrations. Elizabeth II had succeeded her late father, King George VI, the previous year, and she officially took the throne on the 2nd of June 1953 at Westminster Abbey. 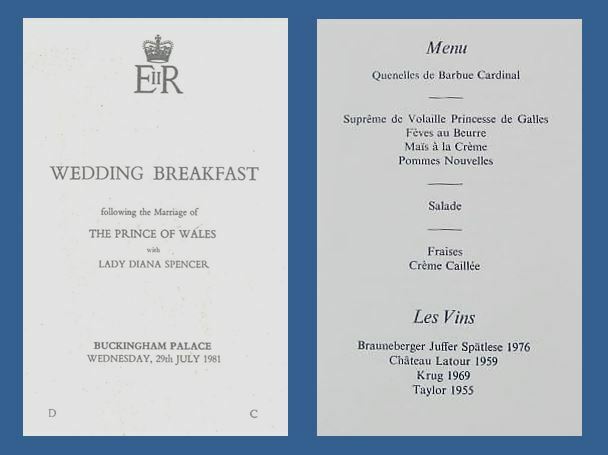 At the Buckingham Palace ceremony that followed, the new Queen was served the 1943 Dom Pérignon. Whilst that all makes nice easy reading, here’s where it gets a little more complicated. The last special thing to mention about the 1943 vintage is the subject of ‘transvasage’ – in essence the moving of liquid from one vessel to another. Dom Pérignon comes in the famous squat green bottles to mimic those from the late 18th century, and this was part of the luxury premise that Robert-Jean de Vogúé formulated in 1932 and finally released to market in 1936. This being the case though – how was it that the 1921, 1928, 1929, and 1934 vintages were already stored in those bottles when the time came to release them? A key element of the process of making Champagne (in the traditional French way) is that the wine undergoes its’ second fermentation in its own bottle, and they go to a lot of trouble to ensure that this is the case. In order to keep the liquid inside whilst removing any remaining deposits or dead yeast cells (AKA the lees), the necks of the bottles are flash-frozen and the deposits expunged in a quick process known as disgorgement. This surely meant that the early vintages, bottled before Dom Pérignon was conceived, were stored and matured in the cellars in their standard Moét bottles? I certainly can’t think of another way that they could have been maturing wine in a special bottling years before the idea was mooted, and it makes sense that at some point, the original bottles were opened, and the liquid poured (or transvasaged, if you will) in to the special green bottles, ready for release as Dom Pérignon. I was very interested to read then, that Dom Pérignon winemaker Richard Geoffroy has never fully accepted the idea that the bottles were tranvasaged. No true evidence exists either for or against the idea (any invoices for thousands of green bottles would be a good start! ), and so it technically remains a mystery. It’s likely that the 1943 vintage also underwent the transvasage process. Even though Dom Pérignon had commenced production by this point, the war would probably have been driving different vineyard priorities. So, for me, it was the 1943 vintage that saw the end of the first era for the brand. 100 years of Simon Bros.
We give the credit to Moét as the first Champagne house to introduce a Prestige Cuvée, but if the question is looked at in terms of the production of a top of the range exclusive blend for a specialised market, the accolade would have to go to Louis Roederer. The firm were producing their prestige cuvée Cristal way back in 1876, a full 59 years ahead of Moet, but it wasn’t a commercial venture. The Russian preference towards Champagne erred towards a sweeter wine, different to that of France and the rest of Europe, and this difference in style meant that any commercial sights that the company could have would be impossible to fulfil. The wine therefore remained exclusively for the consumption of Tsar Alexander II and his court, in a clear bottling – allegedly to ensure that the drink was not tainted or impaired in any way. Following the Russian revolution of 1917, the demand disappeared, and any remaining bottles were eventually sold off to South America. Demand for Champagne in the early 1930s was muted. The after effects of the great depression reached the French economy in 1931 and, when the understandable plan of cutting retail prices to help shift bottles was put in to place, heavy financial losses were incurred by the producers. This in turn meant that some had to sell off key vineyards, and some simply went bust. The market needed stimulation, and in 1932 English Journalist Laurence Venn suggested (in his capacity as marketing consultant to the Syndicat de Grandes Marques de Champagne) that, instead of focusing on discounting at the lower end, they needed to aim for the top end of the market. Needless to say the idea was unanimously rejected by the Syndicat, who offered that if they couldn’t move cheap bottles, how would they be able to sell more expensive ones? Venn reasoned that the aristocracy were the only people who continued to have money during the financial difficulties for such extravagances as Champagne, and a top quality wine costing twice the price of standard Champagne would be of appeal. Following this rejection, Venn was approached by Comte Robert-Jean de Vogüé – a descendent of the Moéts and in charge of commercial affairs for the company. 1935 marked the 100th anniversary of Moét’s London based agent, Simon Bros. and Co, and Robert-Jean was looking for a way to thank their top clients for sticking with them during the hardships. In tandem, the exercise would also be a good way of Moét thanking their agent too. Many of the failing Champagne producers had naturally blamed their distribution network for failing to find suitable markets for their wine in the depression, and fired them outright. In the anniversary year the idea came to fruition, and 150 of Simon Brothers’ most illustrious clients would find themselves receiving a hamper with 2 specially commissioned bottlings of Moét. In order to differentiate it from the normal bottlings and to add prestige, each bottle was a hand blown replica akin to one their ancestors would have seen back in the late eighteenth century. Corks were secured in the old style using string, and sealed from dust and dirt using green sealing wax. The label was adorned with vine shoot motifs (known as ‘ppmpres’) by the engraver Deletain. 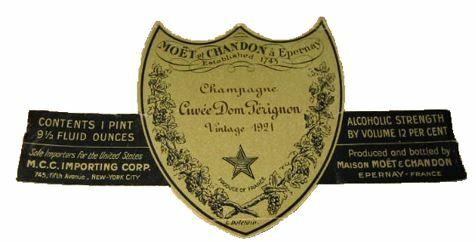 No brand was mentioned on the bottle – the label inscription simply read “Champagne especially shipped for Simon Bros. and Co.’s Centenary 1835-1935″, but there is no doubt that the wine in the familiar shaped bottle with the iconic shield label was clearly the forerunner to Dom Pérignon. The vintage used was the 1926, a small but fine yield that had 9 years of maturity by this bottling. The yields for that year were small for a variety of reasons including slow flowering (which brought about coulure), as well as chlorosis, insect damage, and rot. Aside of intermittent hailstorms, September bought fine rainless weather than aided the ripening, and grapes were picked quickly, albeit slightly later than usual. As the 1926 hadn’t been released as usual in the early 1930’s due to the financial crisis, not all shippers had declared the vintage. This meant that the year was held in esteem and attracting a good price. Word of this unique bottling quickly spread from the wealthy recipients to their friends across the Atlantic in America, who were revelling in a post-prohibition frenzy. Moét & Chandon soon found themselves inundated with requests as to when the wine would be available to them. 1936 saw the first commercial bottling and, in order to maintain the maturity levels shown in the previous bottling, the next successful vintage available was chosen. As the years following 1926 had either seen poor harvests or ones that weren’t ready at this time, they had to delve further back in to their wine stores, choosing the 1921 vintage. At 15 years old already this must have been a sublime bottling, equivalent to what Moét release today as their Dom Pérignon P2 (aka Plenitude 2 – wines that have reached their second plateau of maturity). The year had begun with heavy frosts in the winter and spring which destroyed much of the crop, but this was followed by a gloriously hot summer, and when harvest commenced on September 19th, the grapes that remained produced an excellent wine. At the helm for this blend was celebrated winemaker Ernest Goubault, then in his final year with the company, and it was he who created what was destined to become the most expensive Champagne available on the market at that time (around $90 per case of 12 bottles). As the label couldn’t bear the Simon Brothers inscription from the previous year a new branding was needed. To further increase the prestige, Comte Robert-Jean de Vogúé decided to name it after the forefather of Champagne – Dom Pérignon. Interestingly the brand name was previously owned by Champagne house Mercier but went unused. It was gifted to Moét as part of the dowry on the marriage between Francine Durand-Mercier and Comte Paul Chandon-Moét in 1927. New York received 100 cases (1,200 bottles) of the Dom Pérignon 1921 in the November of 1936 just in time for Christmas and New Year celebrations, shipped across courtesy of the French luxury liner ‘The Normandie’. Needless to say, it was a huge success, to such an extent that France didn’t even get an allocation – it all went to quench the thirst of the important American market. 16 bottles which had belonged to Doris Duke (daughter of James Buchanan Duke, and heiress to the billionaire fortune of the American Tobacco Company) were famously sold at a Christie’s auction in New York City in June 2004. Showing her importance as a wine buyer in the 1930’s, Duke was able to be allocated 100 bottles from this limited first shipment just for herself, and in the years following her death her cellars and its pristine contents of many memorable producers and vintages were sold off for well over the pre-sale estimates. In order to keep the quality level of Dom Pérignon at its peak, there would be another few years of maturity required to ensure the next successful available vintages – the 1928 and 1929 – could be enjoyed. 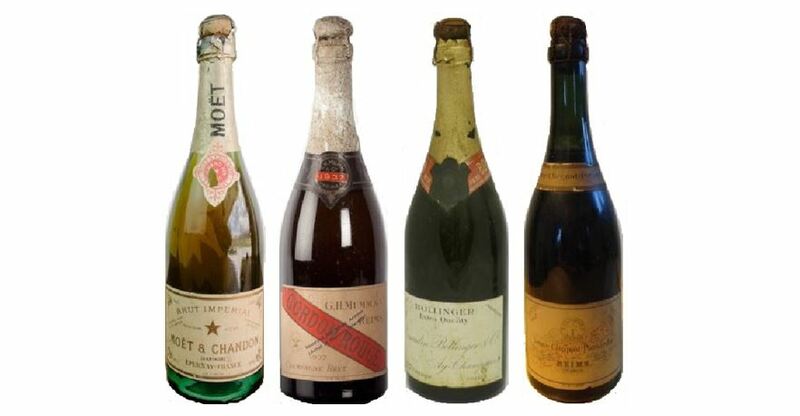 In the end, due to the running seam in the Champagne story of success mixed with hard times, it would be post-war palates that would have the pleasure of drinking them. By way of introduction to my upcoming series of articles on the history of Dom Pérignon, I thought I would offer up some general notes on the Champagne region from the start of the 20th century, leading up to the first release. Hopefully this will act as a primer for the general mood of France at that time. Champagne remains a by-word for special occasions, celebrations and good times, but travelling back in time 100 years shows the region ravaged by war, vine disease and poor harvests. Today, all of the big Champagne houses produce a Prestige Cuvée, a showcase for their top wines blended to perfection, and made in limited quantities. Back in the 1930’s it was unheard of. Dom Pérignon was the first and is arguably still the King of them all. In such a time of austerity, why were Moét & Chandon even thinking about launching such an extravagant product? The harvest of 1899 had been excellent and spirits were high. The next two harvests produced pleasingly large yields, but the resulting grapes lacked the acidity needed for ageing and thus produced wines suitable only for short term consumption. Subsequently, the prices paid to growers began to tumble, all the way down to the level paid for grapes destined to make simple ‘Vin Ordinaire’. Fluctuating quality across each of the Champagne houses meant that the good wines had to be sought out amongst the bad, and consumers began to rely on their personal stocks. With the notable exception of 1904 which produced a bumper crop of slow maturing wine, and a ‘good’ vintage in 1906, the next few years all produced failures at vintage time. This came to a head with the 1910 vintage, which was severely blighted by insects, mould and mildew. The net result of this was that, instead of producing the usual 30 million bottles of Champagne, they only produced circa 1 million. Producers needed a good vintage to stay in business, and they certainly got that in 1911, but the good fortune would come at a cost. The Champenois are notorious to this day for protecting their brand, and it was around this time that the first formal land classifications were being drawn up as to what vines could be included as part of Champagne. Without any Grand or Premier Cru sites to its name, the southern area of Aube was excluded as being of a second standard. Soon after, the Government passed a bill to this effect and the understandably angered Aube vignerons went in to revolt around the rest of the region, destroying whatever came in to their sights. Needless to say, a worried government hastily annulled the original bill, but not before several people lost their lives, and land and vines had been burned. The Aube were finally officially admitted in to the region in 1927, but their primary function to this day is rounding out Champagne blends, existing as something of a minority partner. No sooner was this internal conflict coming to a conclusion, the shadow of war arrived, bringing four years of massive destruction. France’s involvement in the First World War in 1914 came towards the end of a blisteringly hot summer, and the Germans had reached the vineyards before the first grapes had been picked. The vineyards initially survived the early part of the war intact; such was the belief by the invaders that they would soon be the owners of the land. Following two average years, the harvest of 1914 was desperately needed, but again came at a price. Continuing business as usual meant that just being in the vineyards was dangerous work, and many women and children lost their lives there whilst the men were fighting and dying at the front. At the conclusion of the war, Champagne had lost half of its residents, literally wiping out a generation, and forty percent of its vineyards were ruined or poisoned from shelling. Now in desperate need of physically rebuilding itself, Champagne was also financially ruined with the treasuries having been looted. In addition, many thousands of bottles of champagne had been destroyed – either being given to French soldiers to boost morale, or drunk by the invading army. Understandably, the vintages between 1914 and 1918 had all fared as either modest or poor, and produced less than average yields. Nearly three quarters of the best vineyards no longer existed, and what vines hadn’t been destroyed outright were dying a slow death, through either lack of labour, or materials such as fertiliser. Whilst the vineyards were ripped up and replaced, the difficulty of exporting any Champagne out of France meant that there was no shortage fulfilling the thirst of post war euphoria, and both the 1919 and 1920 vintages were immediately consumed. The build up of stocks further continued due to the loss of sales to a post-revolutionary Russia, and would soon be further affected by an America dry under Prohibition (1919-1933), and then in financial straits following the Wall Street Crash of 1929. The 1920s only managed a handful of excellent vintages – The 1921, 1928 and 1929. All three of these years would eventually be made in to the first commercial releases of Dom Pérignon.